Chondrosarcoma is a type of malignant bone tumor that most commonly effects the pelvis, sternum, scapula, or cartilage of long bones in the extremities. Typically, chondrosarcoma forms within bone or cartilage cells around the articular surfaces and can be either slow-growing and form spontaneously, or due to malignant changes in a preexisting (secondary) bone tumor. Chondrosarcoma is the most common malignant cartilage tumor and the third most common bone sarcoma (behind osteosarcoma and Ewing's sarcoma). This pathology commonly occurs in adults between the ages of 20-70, males slightly more affected than females, with peak occurrences in the fifth and seventh decades. It is possible to develop chondrosarcoma at younger age groups, which usually leads to higher malignancy and metastases rates. The sites most often affected are the proximal femur, followed by the proximal humerus. Clinical features seen in patients with chondrosasrcoma include age >25 years old, inflammatory pain (pain with palpation), axial skelton involvement. Targeted therapy for bone cancers include Imatinib and Denosumab, however there are no medications directly related to treating chondrosarcoma specifically, beyond traditional chemotherapy. Following surgery, Hydrocodone can be prescribed for pain to the patients. Chondrosarcoma is initially assessed for aggressiveness via radiographs. CT and MRI are used to view the amount of cortical loss seen. A biopsy is later performed to confirm the diagnosis. Pathologists follow up with histology to grade the tumor. As a whole, the epidemiology of soft tissue sarcomas is not well understood. Although there is no proven genetic disposition, some studies indicate exposure to certain herbicides, wood preservatives, and radiation lead to an increased risk of development. Currently, chrondrosarcomas are thought to form spontaneously or from preexisting bone tumors that have become malignant. Benign bone tumors (osteochondromas, enchondromas, chondromas) that become malignant are referred to as secondary chondrosarcomas and are still composed of cartilaginous tissue entirely. Following a biopsy to confirm the diagnosis, surgery is the most common procedure to remove the tumor. Even for higher grade tumors, limb-sparing curettage (via cryotherapy) is more common, with amputation occurring in rare instances. Unlike most cancers, typical chondrosarcoma does not respond to chemotherapy and is resistant to radiation therapy. 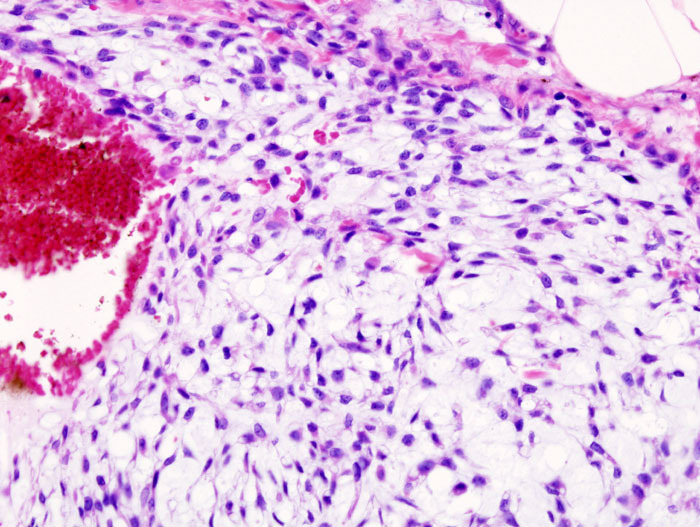 Different forms of chondrosarcoma including dedifferentiated and mesenchymal may be trial chemotherapy before or after surgery and follow a similar protocol to osteosarcoma and Ewing's sarcoma respectively. Depending on the grading of the sarcoma, proton-beam radiation has had some success, but does require very high doses and is considered less frequently than surgical approaches. Physical therapy management will most often occur following surgery to excise the tumor. Depending on the site of the lesion, the surgeon may have different protocols, but physical therapy can focus on treatments that will decrease pain, decrease edema, and improve patients' quality of life. Following surgery, an acute care physical therapist will teach the patient skills like bed mobility, weight bearing precautions, ambulation, and stair negotitation. In outpatient physical therapy, the patient will undergo manual therapy and soft tissue mobilization to improve tissue extensibility, reduce edema, and improve range of motion. The patient will also perform therapuetic exercises to increase range of motion and muscle strength to address deficits normally seen following surgery. Gait training will continue to be incorportated and adapted to the changing weight bearing precautions set forth by the surgeon. As the patient progresses, the treatments will progress to become more functional and incorporate activites that are important to the patient. Currently, there are no evidence based, documented reports of alternative/holistic management for chondrosarcoma. Chondrosarcoma presents similarly to other musculoskeletal injuries/illnesses of the affected joint. 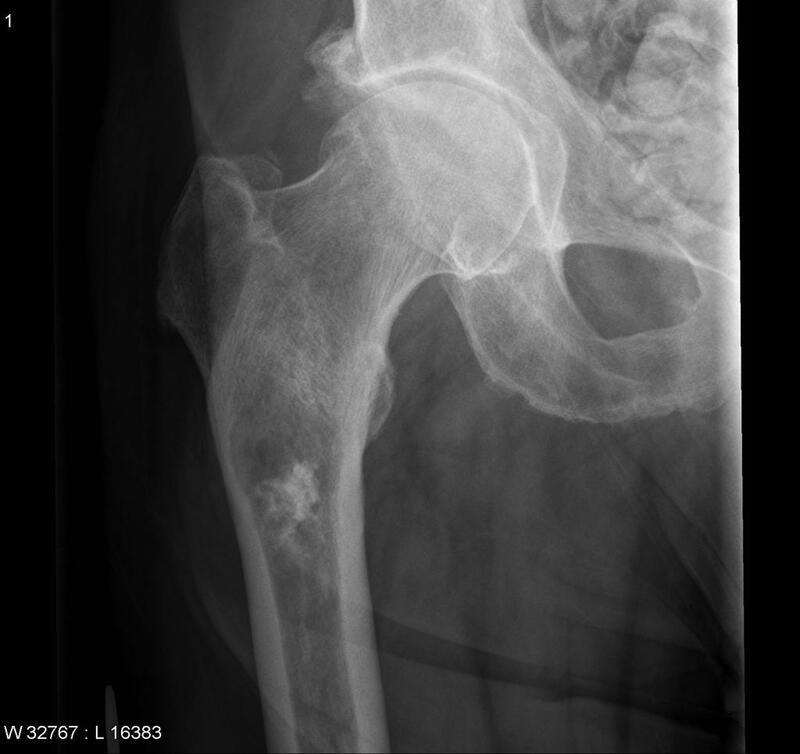 For example, a patient with chondrosarcoma of the hip will complain of intermittenet anterior thigh/hip pain. The pain can present as either hip joint in origin or nonarticular hip origin. Other diagnoses with pain of hip joint origin include osseus necrosis, stress fracture, hip dysplasia, or intra-articular pathology (labral tear, ligamentum teres tear, or loose body in the joint). Diagnoses of nonarticular hip origin of pain include bursitis, tendonopathy, muscle strain, urogenital conditions, metabolic disease, vascular conditions, or infection. Ferrer-Santacreu E, Ortiz-Cruz E, Díaz-Almirón M, Pozo Kreilinger J. Enchondroma versus Chondrosarcoma in Long Bones of Appendicular Skeleton: Clinical and Radiological Criteria—A Follow-Up. Journal Of Oncology [serial on the Internet]. (2016, Feb 23), [cited April 10, 2016]; 1-10. Available from: Academic Search Complete. ↑ 1.0 1.1 1.2 1.3 Goodman C, Snyder T. Differential Diagnosis for Physical Therapists: Screening for Referral. 5th ed. St. Louis, Mo. : Saunders/Elsevier; 2013. Pg. 521. ↑ Goodman C, Snyder T. Differential Diagnosis for Physical Therapists: Screening for Referral. 5th ed. St. Louis, Mo. : Saunders/Elsevier; 2013. Pg. 522. ↑ Goodman C, Snyder T. Differential Diagnosis for Physical Therapists: Screening for Referral. 5th ed. St. Louis, Mo. : Saunders/Elsevier; 2013. Pg. 519.